Take one part time-trial racing, two parts technical mastery and a pinch of puzzle solving, and you’re close to encapsulating Trackmania. 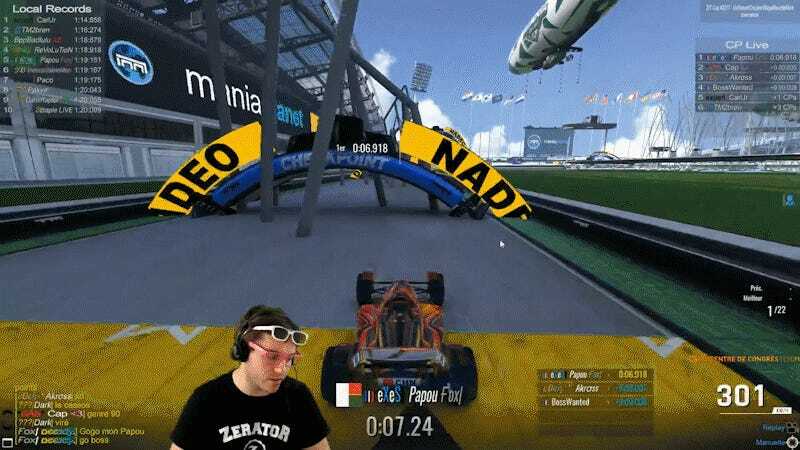 This weekend, qualifiers for the 2017 Trackmania Cup are taking place, and it’s like watching Formula 1 racers attempt to solve a physics-based Rubik’s cube with their cars. Right now, some of the best in the game are competing on custom-made tracks to qualify for the 2017 Trackmania Cup, hosted by French commentator and track creator Zerator. To qualify, racers have to beat each other and the insane raceways that Zerator has concocted at the fastest pace possible. Hairpin turns and a myriad of obstacles as seen in the above clip are just some of the challenges racers have to overcome. Trackmania combines the speed and handling of racing with the challenge of seemingly impossible courses. Part of the skill involved isn’t just good driving, but quickly learning and internalizing the tricks of each track. All the while, Zerator (in his dual-sunglasses and headset) commentates over the action. It’s probably fascinating to hear commentary from the mad racing scientist himself on the courses he made, but it’s all in French, so I’m often left to interpret exciting developments from the tone and volume of his voice. Still, it’s good fun if you like watching excellent racers tear through Super Mario Maker-esque racetracks at F1 speeds. Qualifiers run through today on Zerator’s channel, as eight racers will move on through to the championship, taking place July 1.